Like a growing number of millenials, my son Quinn has taken up residence in Tijuana and commutes to work in San Diego. Drawn by the affordable housing and thriving culinary and music scene, these young professionals are just saying no to the San Diego cost of living and doing their own thing south of the border. A few months back I planned a trip down to check out his world and of course do some exploration of the culinary scene. My checklist included Caesar's for the original Caesar salad, a Xolos soccer game, brunch at a trendy TJ spot, then a Sunday afternoon road trip to Valle de Guadalupe to the renowned Deckman’s. I arrived in Tijuana late Saturday afternoon and was quickly thrown off by the intense traffic scenario just over the border. It didn’t help that my international roaming did not kick in until about 10 minutes in, leaving me unable to navigate, text or call. For future reference I’ve been told that when just over the boarder, shut your phone off and when you boot it back up the international plan will kick in. After the mild traffic panic, I reached Quinn’s place where we unloaded and headed straight to Caesars for the object of my salad lust. I’ve had a version of the original Caesar a few years back at Romesco in Bonita. Restaurateur Javier Placencia owns both Caesars and Romesco so if you don’t want to cross the border for it you have that option. There is nothing like getting it from the source and Caesars is very old-school and that romances the salad even more. You will see the chopping block cart on wheels moving from table to table with the servers expertly working their magic chopping, cracking and mixing the ingredients in a manner that has been done since it was invented in 1927 or thereabouts. It consists of romaine lettuce, olive oil, Worcestershire sauce, ground mustard, crushed garlic, coddled egg, lime juice, fresh black pepper, grated Parmesan cheese, baguette oven baked garlic croutons and Anchovy filets. Before you freak out on the anchovies let me assure you that all these ingredients blend so seamlessly to create one of the best salads you will ever experience. It should be noted that there is a full menu and a bustling bar scene at Caesar’s as well. It’s located on the busy Avenue Revolucion in the Centro district of TJ so there is plenty of action surrounding it. Dinner was followed by a Tijuana Xolos soccer game which is a major sporting event, drawing fans from as far as Los Angeles. The tailgating scene was similar to our football version with the addition of roaming mariachi bands providing a soundtrack to the experience. Nothing notable to report on the stadium food offerings and that was somewhat disappointing. That said, the Xolos have a loyal following and it’s a raucous environment. Sunday morning started with a nice brunch at an elegant joint with a hipster edge called Alma Verde. It was a nice slice of calm and a perfect transition to the incredible culinary experience that we were about to embark on 90 minutes south in the Valle de Guadalupe. The coastal drive down is very scenic then it gets even better as you cut inland to wine country. Deckman’s en el Mogor is the official name and I’ll just say up front this place should be on the list of every serious culinary aficionado in San Diego. Seriously, it’s that good and the adventure of getting there is half the fun. Chef owner Drew Deckman grew up in Peachtree City Georgia and after completing a degree in philosophy from Rhodes College began a journey that took him all over Europe. That journey included working with some of the biggest names in the culinary world and earned him a coveted Michelin Star for his work in Restaurant Vitus in Germany. That is just a snapshot of his culinary accomplishments as there are far to many to list here. The term farm to table is not some marketing jargon at Deckman’s. They are literally surrounded by the farms and ports that provide a very high percentage of ingredients, not to mention the wine. The indoor-outdoor structure itself is amazing and the outdoor, wood fueled kitchen is a sight to behold. The scent of burning wood cooking quail and other such culinary delights is almost overwhelming in the best possible way. There were times during our meal, with the sensual aromas, the stunning visuals of the vineyard, and my good company, that I thought to myself “it does not get much better than this.” And it really doesn’t. And on top of the world-class culinary experience, Drew Deckman is just a really nice guy. 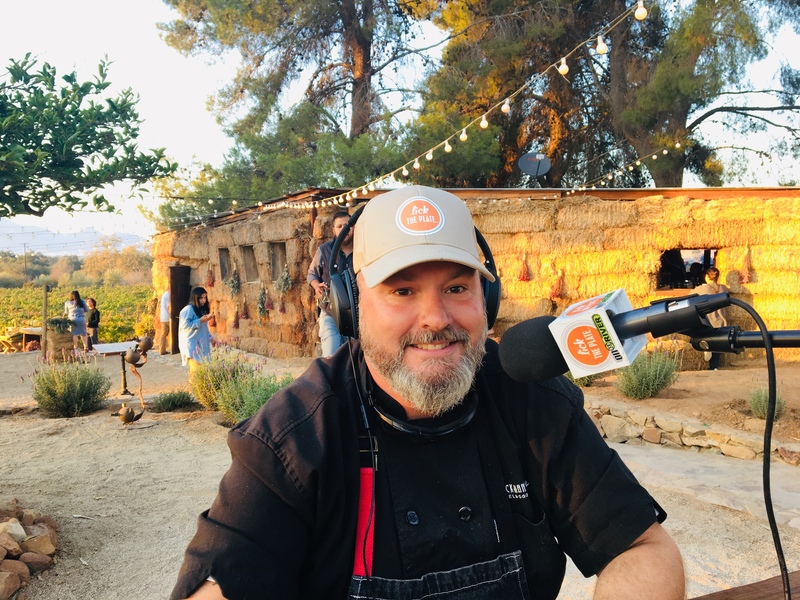 I will admit I was a bit intimidated by his fame within the culinary world going into our LTP radio interview but was immediately charmed by his approachability and sense of humor. Given that I had a designated driver, we made the drive back to TJ early that evening. My advise would be to book one of the many lodging options in the area so you can enjoy the very impressive local wine and not have to make the drive back and deal with the border crossing on a Sunday evening. There has been a lot of negativity surrounding Tijuana and the surrounding area and yes, it can be a dangerous area, but so can any city that size. I will be back as there is much more to explore in the area.